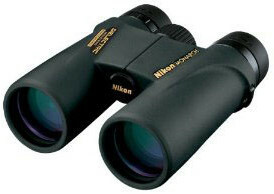 The Nikon Monarch binoculars and, more specifically, the Nikon Monarch ATB binoculars series, provide value with optical quality commonly found only in more expensive binoculars which, when coupled with the durability of its alloy, rubber armored body, will satisfy the needs of many users, including birdwatchers and wildlife observers. Please note that this is a review of the Monarch ATB binoculars available prior to the introduction of the Monarch3, 5 and 7 models. We understand this Monarch ATB model is being discontinued by Nikon. The Nikon Monarch ATB binoculars have fully multi-coated lenses and the phase-corrected prisms are made of BaK-4 glass - all of which work together to enhance resolution (details), brightness, and image contrast. Nikon Monarch ATB binoculars with 42mm objective lenses have been updated to include a "dielectric high-reflective multilayer prism coating" (this model is called "DCF" in Europe) and are said to give nearly the same brightness as perceived by the naked eye. While we have not actually measured the brightness, a quick poll of binocular users will assure you that they are indeed bright. The dielectric prism coating feature used to be found exclusively on the Nikon EDG binoculars at a higher price. Its provides both sharper colors and crisper images - leading some to suggest that this improvement alone is worth the price of a new Monarch. The brightness of the Nikon Monarch ATB binoculars has prompted many positive comments in many forums and stores around the world. Nikon can justifiably take pride in the leadership role it has taken in improving binocular optics while driving down prices in a competitive marketplace. The Monarch's optics are clearly above average and many have found hours of enjoyment with them. You're likely to have a similar experience. Some optics users are more fastidious about the images they wish to view than others. For them, we provide the following observations. Most of them are not likely to even be noticed by most people - even the most fastidious aren't likely to notice most of them without specifically looking for them! While looking at white objects, whether houses, cars, birds or something else, you may note a pink tinge around the object at distances of perhaps a half mile. We've noted that there can also be a slight prismatic flair around brightly lit objects that are fairly close to the field of view's center - a slight purple to blue tinge to the left side and a green to yellow tinge to the right side of the object. They aren't generally intrusive and, again, there's a very reasonable chance you'll not notice them unless you're looking specifically for them. One other optical concern with the Monarchs is mild "pin-cushioning" distortion. These terms describe how optics can appear to be curved, even though they may actually be straight. You can read about it on our How to Buy Binoculars page. The Monarch ATBs may present minor pin-cushioning effects toward the edges which, again, you'll most probably have to specifically look for in order to see it. As discussed on our How to Buy Binoculars page, slight pincushioning or barreling is a tradeoff for avoiding the ball effect. For most users, the slight pincushioning would likely not be a critical item if it's even noticed. Back to the many positives, the close focus of the medium and smaller Nikon Monarch binoculars is 8.2 feet and will allow you to comfortably see details of butterflies, dragon flies, and nearby birds and small animals. The optical features of the Monarchs, working together, mean that low light levels available at dusk and dawn find this advanced binocular providing good service - especially so for those with the 42mm objective lenses and the dielectric prism coating. The Monarch ATB user will be better able to make the most of the prime, twilight times for watching wildlife, mariners will berth safely at home, and hunters will see more activity. Owners appreciate streamlined compactness, slim shape, and durability provided by the roof-prism design. This eases any potential strain in holding them and is a blessing should they fall. The rubber armoring would also seem to contribute to durability and is easier to hold onto than a hard surface - when either dry or damp. The Monarch center focusing wheel is smooth and produces a sharp focus quickly. Monarchs' eye relief ranges from 15.4 mm, for the 12X42, to 19.6 mm, for the 8.5X56, based on the configuration. This eye relief range should accommodate nearly all, but if you find a short eye relief to be uncomfortable, by all means check the chart below. Along with the eye relief's interest to eyeglass wearers, are the rubber eyecups. Nikon Monarch binoculars have the twist and slide design typical of higher quality optics, with four positions: fully-in, fully-out, and two positions between. The intermediate positions are very stable with solid detents and most feel good about them overall. However, a number of people have found that it's possible to break them more easily than they expected. A good way to prevent this is to simply twist them down before putting them into the case. If something should happen and you have an eyecup break anyway, Nikon does have a good reputation for replacing them under warranty. While covers are provided for both the ocular and objective lenses, many complain that they're loose and fall off easily. They're made of hard plastic and, should you see the Monarch ATB in the store, you might reasonably (but wrongly) conclude the lens cover's poor quality was an indicator of the overall quality of the binocular. Since many binoculars don't have covers for the front lenses, they don't seem like a critical issue. This leaves the rain guard for the ocular/eyepiece lenses as the main offending part and it has a stiff bridge joining the two caps. The end result for the eyepieces' rain guard is that, when the Monarch ATB's hinge is slightly flexed, there is enough friction/tension to hold the lens cap in place. When it is in its fully extended position, however, the friction is gone and the cover will spring off whenever inclined to do so. This can be annoying, certainly, and one would expect better covers given the quality of the optics and body. The workaround is to simply keep the hinge a bit flexed in rainy or particularly dusty conditions. On the up side, the neck strap does thread through the end of the rear lenses' cover, so at least they won't get lost if they do come off when least expected. Nikon Monarch binoculars are both waterproof and internally fog-proof. Your OpticsReviewer recommends waterproof and fog-proof binoculars in all cases except where the binoculars are always used inside a building. While it may be possible to find Monarch ATBs that aren't waterproof and fog-proof, we advise against investing in them. Getting caught in a sudden rain shower or slipping while crossing a stream are realities of life! Of course, if you're only going to use your Monarchs to look out from inside a building or your home, waterproofing won't be an issue. While durable, the weight is significantly less than many other binoculars in similar configurations. Many feel that the light weight is a significant benefit when hiking or looking through them for extended periods of time. The body is typically black, but is also available in camouflage for those who like to get particularly close to wildlife. The glass in the Monarchs' prisms and lenses is manufactured without the use of lead or arsenic - otherwise common to special and technical glass manufacturing and refinement. Nikon calls this "Eco-Glass(tm)." The adjustable neck strap is serviceable and neither fancy nor flimsy. It's made of nylon and comfortably widens with some padding at the point where it hangs on the neck. It seems likely to provide service for the lifetime of the binoculars with reasonable care. Nikon provides a cordura travel case big enough to hold the Monarch ATBs with their eyecups extended - just remember that you'll want to twist them down before putting the binocular away. The case has a flap that's held closed with a bit of Velcro and allows the neck strap to be used to carry the encased binoculars over the shoulder or around the neck. It also has a wide nylon belt loop on the back of the case that will allow you to carry them on your belt - which is a nice touch. With the binocular, you'll receive a travel case, objective (front) lens covers, eyepiece rain guard, and adjustable neck strap. Each of the new Nikon Monarch binoculars is backed by Nikon's 25 Year Limited Warranty and No-Fault Repair/Replacement Policy. What do they mean by no fault? If you pay US$10 and return shipping and handling, Nikon will repair or replace it - even if the problem was your fault. If you monitor the forums where people discuss optics, you'll find heart-warming stories of how Nikon has repaired or replaced binoculars returned to them. The Monarch ATBs' best prices approach the lower end of mid-range. You shouldn't find yourself paying much more than about $275 for 36mm objectives, about $325 for 42mm objectives, and about $425 for 56mm objectives, depending on the configuration. We feel the Nikon Monarch ATB binocular is a good optical value for the money - especially with the dielectric coating - and happily recommend them. The average user rating for the Monarch ATB is 5 out of 5 stars. The Monarch ATB may still be available at major online dealers such as Amazon.com and Amazon.co.uk . If you're able to spend just a few more dollars or save up just a bit longer, we recommend considering the Leupold Cascade binocular. Arguably the most popular configuration is the Nikon Monarch ATB 8X42 (also known as the Nikon Monarch ATB #7294), because the configuration is a general purpose workhorse. Probably the follow-up popularity places go to Nikon Monarch ATB 10X36 and Nikon Monarch ATB 10X42 configurations.